More than 38 million Americans traveled for the long Memorial Day holiday weekend, and many are finally home. Most of the airports were packed, and the roads weren't much better. For some, the problem happened as they approached the Ronald Reagan Washington National Airport. The traffic just to get around airport has become such an issue that officials are looking for answers to ease it. 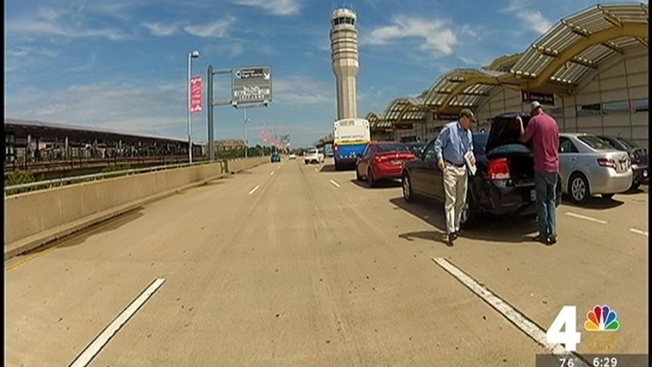 The Reagan National Airport loop turns into a parking lot at times. Shifting flyers to Metro comes with its own issues. Widening the road would encroach on the airport itself and neighboring Crystal City. A new entrance to the airport may have to be considered, but officials are weighing all options. The problem really has to do with DCA becoming a product of its own success. So many flights are taking off and landing and so many people are using the airport that the grounds can’t hold everyone. The cellphone waiting lot usually requires its own wait just to get a parking space. A spokesperson for the Metropolitan Washington Airports Authority conceded travelers aren’t imagining more traffic than ever. The authority said just as added passengers have crowded the terminals, gates and baggage system, they are also crowding the parking and roadways. Terri Boulding, from D.C., said the airport could simply handle the flow better. The airports authority said they are fully aware what is happening at Reagan National. They’d actually like to see a lot of passenger traffic shift to Washington Dulles International Airport so that it would lessen the burden here at DCA. They said they are trying to find traffic alternatives to make it easier for all of users of the airport.